Choose your favorite jelly, jam, or preserves for the filling. Of course, you could go with classic strawberry jam, but why not mix it up? You can even use several different types of jam for the same batch of cookies. Then you and your guests will have to sample each one. If you've got a bunch of those little jars of jam from gift baskets, etc., it can be an easy way to use them up. These are lovely cookies to take as part of a holiday cookie exchange if you can resist keeping them all to yourself. It's also a fun recipe to make with kids, who will enjoy making the thumbprint in the cookie and filling it with jam. Preheat oven to 375 F. Line two baking sheets with Silpat baking liners or parchment paper. In a large bowl, combine flour, sugar, baking soda, and salt until evenly mixed. Add peanut butter and butter. Using a mixer, blend on medium speed until crumbly, about three minutes. Add honey and milk. Mix until the dough thoroughly combined. The mixture will be very thick. Roll the dough into balls about 1-inch in diameter. Using your thumb or finger, press an indentation into the center of each ball, and place each ball 2 inches apart on baking sheet. Bake for 10 to 12 minutes, until the edges of the cookies are lightly browned. Remove the cookies from the oven and let the baked cookies cool for 10 minutes. Then remove the cookies to racks to cool completely. 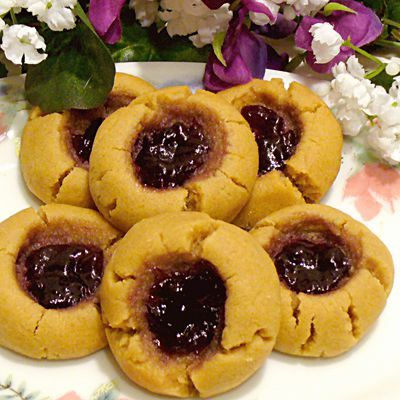 Store peanut butter and jelly cookies in an airtight container. If you'd prefer to avoid the sugars and other ingredients in commercial peanut butter, look for a grocery store that has a bulk food aisle where you can grind your own peanut butter from plain peanuts. It's inexpensive and you will have pure peanut butter to use for the recipe. You can use chunky peanut butter if you like the additional bits of peanut in the cookies.